Have you noticed that gut health is all the rage lately? It’s been reported that about 70 percent of the immune system is housed in the gut, and healthy gut bacteria can improve symptoms of depression, help combat obesity, and provides numerous other benefits such as skin health and energy. Getting in on the food trend is Rowdy Prebiotic Foods that launched an energy bar, the Rowdy Bar with gut-supporting prebiotic superfood Yacon Root that helps lower and regulate blood pressure, boost liver health, and keeps bad cholesterol down. The Rowdy Bar is designed to nurture and repair your gut health. It’s newest flavor; Sunflower Butter N’ Berries is also our favorite. 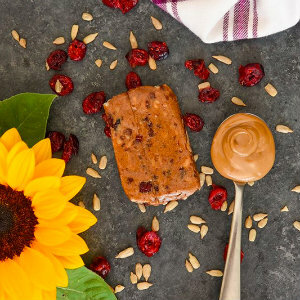 It featured antioxidant-loaded cranberries and protein-packed sunflower butter alongside Yacon Root. Rowdy Bar is made with 10 or fewer whole food ingredients per bar; it’s low glycemic, no artificial flavors. It’s also paleo-friendly, non-GMO, gluten, soy, and dairy-free. In addition to their Sunflower Butter N’ Berries flavor, Rowdy Bars come in Peanutty Dark Chocolate and Chocolate Coconut Cashew. To learn more, visit rowdyprebiotics.com, or pick some up online and at independent grocery stores, gyms, and health centers nationwide.